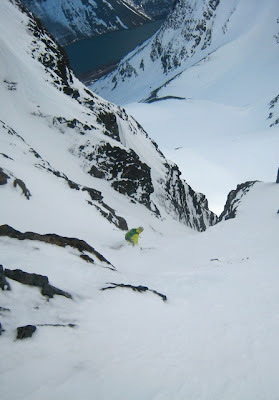 bigtrix: Head for the Couloirs: Lyngen all over again. 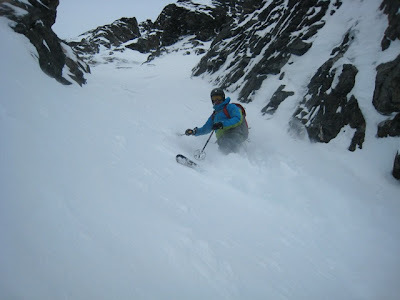 Head for the Couloirs: Lyngen all over again. 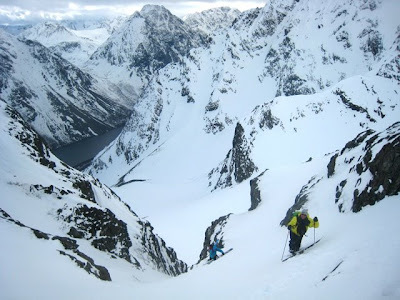 Went back to Lyngen again for the seccond time this season. Worse weather than on the spa boat adventure, but the skiing was good. 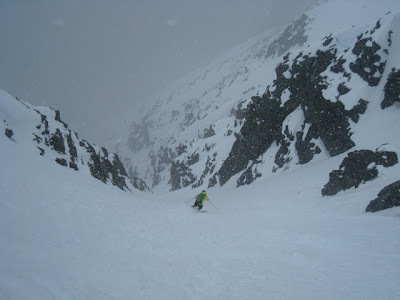 As they say in Narvik: when the weather is arse, go for the couloirs. Hooked up with Rattfallah's Tron Helium and Jens-Monkey Øvervoll, and booted up whatever looked nice, steep and close to the road. Got some sun, some milk, some whiteout, some storm, some rain and some snow... Welcome to the North. 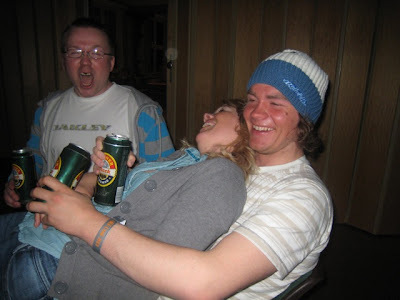 Got two ski days and one dagenderpå-day after a good late night afterski on Saturtay. We had deserved. 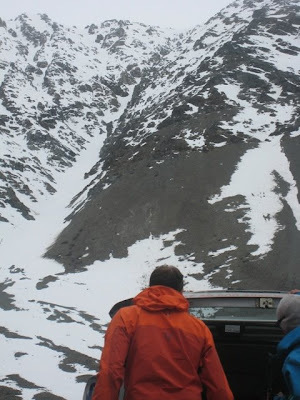 First day we went to urhælvete, or Urda as they say south of the moral circle, and started scrambeling up. Still snow all the way down so went into boot mode early and actually never got out of it since the J-Monkey forgot his skins. 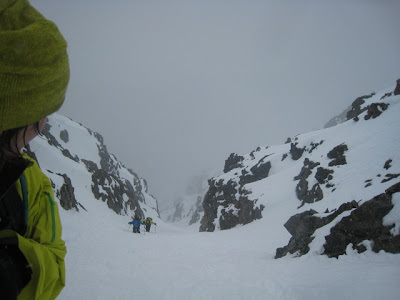 Plan B was good though, to just head for the first couloir we could see and start making steps. Snow was a bit deep in some places actually, makin it hard work in the steepest parts, but soft all over the place so we did not have to change tires. Me heading back down to the fjord. 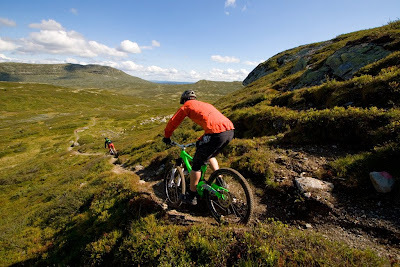 Tron discovering that in Northern Norway the rain you get on the way up is turned into pow on the way down. Another magic phenomenon only found on the right side of the rim. Headed for this chute on the south side of Sultind on day two. 800 meters and ski in / ski out straight from the car. Just the way we like it. Forgot our skins on purpose this time. Nordnorge in the lead as always. 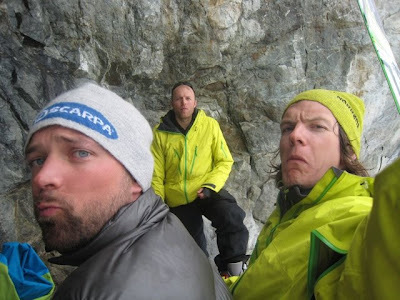 The crew makin our best faces halfway up. Jens-Morten representing Nordnorsk Forening For Harmoniske Dobbeltnavn enjoying the top where it felt like winter again. Fresh, dry snow on top. Locals Ragnar (in the blue corner representing Lyngseidet) and Stian (in the red corner representing Tromsø) enjoyed some beer from the north and chicks from the south after most of the Eldrebølgen had called it the night. Stay tuned. Heading for Lofoten now. Surf and Ski in the worlds most beautiful archipelago is next!